I believe that April 2018 is gonna the best month for me and the people around me. It was a bright Monday morning. As usual, I will try hard to complete my task in the office. Kerja hakiki that always pile up. No merungut for it. Every morning after logged in to the PC, it kinda hard for me to check on my phone. When it's time for coffee break, I sneaked on my phone. Lots of "mentioned", lots of claps and love emoticons. Wondering what happened! Ada orang masuk meminang via IG ke?? Hahahaha. 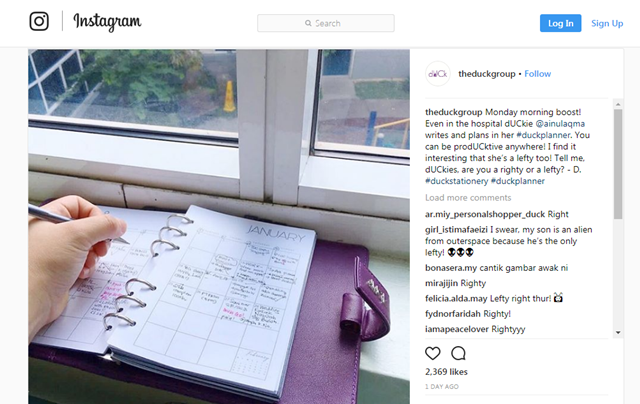 One of my instagram photo got featured in @theduckgroup 's instagram. Allahuakbar. Terus senyum lebar buat kerja lepas tu :) Orang sebelah pun keep asking "Awak ni dah kenapa??" "Nothing. I'm just sooo happy!" Thanks a lot D for featuring my photo in your awesome instagram feed. I feel blessed. 4 comments on "I Got Featured! | theduckgroup"
wowww duck punya ig kot no wonder akak happy hee..
Wahh untungnya. Btw planner duck gojes gila, kalau tak sebab dah beli yang 2018 punya awal haritu, nak grab la satu. Takpe2 nanti planner 2019 nak yang dUCK punya pulak.